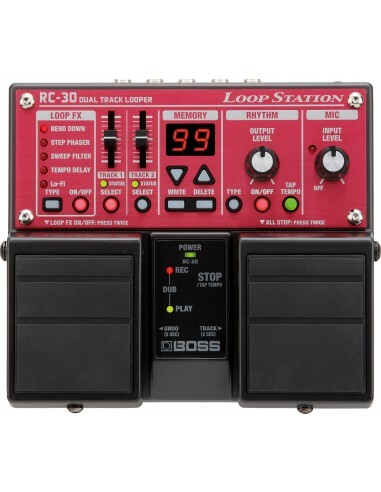 The Boss RC-30 Loop Station Effects Pedal is a twin pedal multi-track looper, featuring two synchronised stereo tracks with a range of built-in effects to give players incredible creative freedom. Create an incredible range of soundscapes with the set of dedicated controls, and store up to 99 custom made loops for instant recalling. Equipped a range of ins/outs and phantom power, players can use the looper with a variety of instrument s and microphones for the ultimate flexibility. Record up to 3 hours and use the USB port to save your loops to keep them safe. With the option to run on batteries or AC adaptor, the RC-30 Looper Station is perfect for creating powerful sounds and songs wherever you go. Maximum Recording Time: 3 Hours Approx. Alkaline Battery (AA, LR6): 7.5 Hours Approx. Carbon-Zinc Battery (AA, R6): 1.5 Hhours Approx.